* Avon Valley Summer League, Broadlands Lakes, Romsey, Hants. Sun, 60. Simon Kiefer (Drennan Bordon Green) 39-0-0, roach and hybrids, balled in groundbait at 6m, boat bay point; Peter Kaye (Drennan Bordon Blue) 35-0-0; Mark Harrington (Tubertini South) 29-12-0; Rob Deacon (Drennan Bordon Green) 24-7-0; Ian Snook (Allans Marine) 23-8-0; Andy Gregory (Drennan Bordon Blue) 23-2-0. Teams: Drennan Bordon Green 53; Drennan Bordon Blue 47; Arun Angling Black 39; Shakespeare Hansfords 38; Arun Angling Red 34. League: Drennan Bordon Blue 100; Drennan Bordon Green 93; Arun Angling Red 73; Sensas A4, Shakespeare Hansfords, and Arun Angling Black all 71. * Bait-Tech Viaduct Spring League, Somerton, Somerset. Sun, 55, Campbell, Cary and Lodge lakes. Keith Masheder (Bait-Tech Viaduct) 250-4-0, 24 carp, bomb with pellet and meat, peg 98 Cary; Andy Neal (Frenzee/Bait-Tech) 220-7-0; Martin Preston (Bait-Tech Viaduct) 208-5-0; Steve Seagar (Maver Veals) 187-10-0; Steve Tucker (Garbolino) 178-15-0; Mark Wynne (Bait-Tech Viaduct) 169-2-0. * Essex Inter Club League, Southminster Pits, nr Colchester. Sun, 60. Reece Hearne (Braintree) 142-13-0, 26 carp to 8 lb, dead maggot over groundbait in corner peg margins, Pit 6; Russ Samuals (Maldon) 78-12-0; Paul Chambers (Harwich) 67-0-0; Ian Carter (Colchester APS A) 48-13-0; Gavin Askew (Does) 45-2-0; Phil Bloxham (Maldon) 44-6-0. Teams: Colchester APS B 46; Maldon 44; Does 43; Colchester APS A 39 ; Chelmsford Red 36. * Maver Mega Match This! Qualifier, Bait-Tech Viaduct, Somerset. Sat, 120, all lakes. Simon Keifer (Drennan Bordon) 172-14-0, 40 carp, long poled pellet down margin, peg 135 Campbell; Scott Russell (Tackle UK) 159-8-0; Roy Worth (Bait-Tech Viaduct) 120-11-0; Paul Terry (Ridgemere) 116-13-0; Dan White (Bait-Tech Viaduct) 110-10-0; Phil Kenning (Solihull Angling) 107-9-0. * Ockendon Bait and Tackle, Puddledock Farm, Ockendon, Essex. Sun, 53. Graham Dack (Middy/Marukyu) 117-8-0, 20 carp to 14 lb, meat at 5m, peg 39; Alan Tuck (Angling Direct Suffolk) 115-0-0; Jason Collins (Preston Innovations Delcac) 111-4-0; Gavin Bridge (DH Floats) 106-8-0; Deane Swift (Matrix Sonubaits) 104-0-0; Mark Brown (Browning Wickford) 92-0-0. * Oxford DAA, River Thames, Medley and Folly, Oxford. Sun, 40. Peter Scott (Drennan Banbury Gunsmiths) 15-10-0, bream and skimmers, feedered worms, peg 24; Mick Denton (Drennan Banbury Gunsmiths) 14-11-0; Darren Wright (Sensas A4) 14-7-0; Geoff Lewenden (Drennan Banbury Gunsmiths) 13-14-0; Dave Kirk (Oxford Isis) 11-4-0. * Rye DAS Club League, River Rother, Newbridge, Kent. Sun, 48. Grenville Weston (Advanced Pole Repairs) 30-0-0, skimmers and roach, poled worm and maggot, peg 1; Barry Chapman (Maver Cardinals Green) 16-8-0; Dennis Price (Iden Wood Fishery Red) 12-1-8; Steve Arno (Maver Cardinals Black) 11-10-0; Kevin Baptiste (Sensas South East Gold) 11-4-0; Richard Taylor (Sensas South East Marine) 11-0-0. Teams: Advanced Pole Repairs 38; Sensas SE Marine 35; Maver Cardinals Green and Iden Wood Red both 33; Sensas SE Gold 32.5; Maver Cardinals Black 27. League: Sensas SE Gold 166; Advanced Pole Repairs 162; Sensas SEMarine 157; Maver Cardinals Black 145; Iden Wood Red 135; Maver Cardinals Red 129.5. * Terry Whiting Memorial, Fennes Fishery, Braintree, Essex. Sun, 33. Troy Doherty (Tendring Tanglers) 69-10-0, F1s and bream, pellet waggler and method feeder, Ash Grounds Lake peg 22; John Shepherd (Colchester Bait and Tackle) 59-8-0; Neil Hood (Tendring Tanglers) 48-12-0; John Down (Tendring Tanglers) 48-8-0; Augustus Lee (Tendring Tanglers) 35-0-0. * Tylers Common, Brentwood, Essex. Sat, 31. Alan Kuzas (Tylers Common) 208-0-0, carp, pellet feeder , Horseshoe Lake peg 54; Cliff Adams (Browning Wickford) 183-0-0; Mark Brown (Browning Wickford) 149-8-0; Gary Ford (Ockendon Bait and Tackle) 136-8-0; Alec Roberts (Garbolino) 131-8-0; Ross Harold (Ockendon Bait and Tackle) 128-6-0. * Wiltshire Air Ambulance, Bristol Avon, Staverton and Barton Farm, Wilts. Sun, 59. Gary Cross (Sensas Thyers) 20-8-0, four bream, groundbait feeder and red maggot at Barton Farm; Robin Guy (Devizes MG) 15-15-0; Gary Etheridge (Garbolino BVMG) 12-6-0; Chris Hook (Maver Cadbury Angling) 12-5-0; Kev Abigail (Garbolino BVMG) 11-9-0; Richard Chave (Garbolino BVMG) and Andy Ottaway (Preston Innovations Thatchers) both 9-5-0. £600 raised for charity. Angling Trust and Canals and Rivers Trust Stillwater Championships Qualifier, Clattercote Reservoir, Banbury, Oxon. Charles Simpson (Sheffield) 29 Kg 980 gr, ten carp, long range pellet waggler, permanent peg 93; Paul Cooke (Leicester) 28.760; Geoff Ringer (Ringer Baits) 22.060. Qualifiers: Simpson, Paul Knapman (Rugby) and Jamie Hughes (Maver Bag’em). Back Arun, Arundel, Sussex. Sun, 15, Carp Lake. 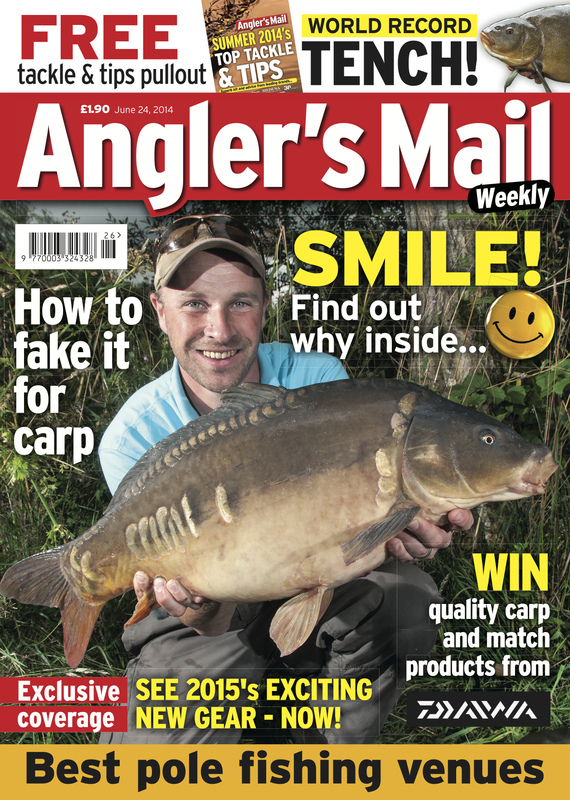 Paul Romaniuk (Back Arun) 55-4-0, carp, poled meat, peg 29; Terry Madden (Back Arun) 47-8-0; Barry Pullen (Back Arun) 44-0-0. Bait-Tech Viaduct, Somerton, Somerset. Thurs, 24, Campbell and Cary lakes. Mark Wynne (Bait-Tech Viaduct) 186-15-0, carp on pole and pellet shallow, peg 130 Campbell; Steve Long (Bait-Tech Viaduct) 157-8-0; Scott Russell (Tackle UK) 140-5-0; Kev Dicks (Maver Bathampton) 135-1-0. Silvers: Ian Parsons (Sensas M5 Angling) 34-4-0. BK Fisheries, St. Erth, Cornwall. Sun, 12, Bill’s Pool, silvers. Alex Bradley (BK Fisheries) 25-8-0, bream to 4 lb and roach, worm over groundbait, peg 8; Bill Knott (BK Fisheries) 24-8-0; Sam Bawden (BK Fisheries) 19-4-0. Colemans Cottage, Witham, Essex. Tues, 17. Jim Dodkins (Colemans Bait and Tackle) 254-0-0, carp, peg 19; Gary Bell (Lakelands) 227-0-0; Gavin Bridge (DH Floats) 216-0-0; Cliff Adams (Browning Wickford) 174-0-0; Tony Martin (Colemans Bait and Tackle) 153-0-0; Jeff Church (Matchpack /Colemans Bait and Tackle) 150-0-0. Thurs, 16. Jim Trew (Matchpack Colemans Bait and Tackle) 221-8-0, carp and barbus, Wood peg 5; Jeff Church (Matchpack Colemans Bait and Tackle) 188-0-0; Tony Martin (Colemans Bait and Tackle)168-0-0; Gavin Bridge (DH Floats) 158-0-0; Frank Thomas (Browning Wickford) 157-0-0; Jim Dodkins (Colemans Bait and Tackle) 145-0-0. Dynamite Oakfield, Aylesbury, Bucks. Sat, 20, Red Kite and Swallow lakes. Joff Rogers (Frenzee GOT Baits) 133-1-0, 100 F1s, pellet shallow, Red Kite peg 19; Mark Giles (Dynamite Baits Oakfield) 115-9-0; Dave Stratfull (Dynamite Baits Oakfield) 111-7-0; Martin Warrell (Dynamite Baits Oakfield) 108-15-0. Sun. 17, Red Kite Lake. Gary Thorpe (Chiltern GOT Baits) 163-0-0, carp to 8 lb, banded pellet at 12m on deck, peg 14; Matt Brayfield (Miracle Baits) 141-15-0; Andy Blackwell (Dynamite Baits Oakfield) 89-12-0. Essex Veterans, Fennes Fishery, Braintree, Essex. Wed, 13. Liz Larkin (Cariers) 26-3-0, skimmers and F1s, feeder and poled corn; Maurice Southall (Cariers) 26-0-0; Ken Rolfe (Bill’s Tackle) 24-4-0. Garbolino Bolingey, nr Newquay, Cornwall. Fri, 24, White Acres Residents. Phil Morris 152-14-0, carp on bomb and pellet, peg 15; Corrie Wagstaff 150-6-0; Stuart Lister (Spro) 138-8-0; Dave Fantam (Leegem) 138-4-0. Gillingham AA, Juniors, Revels Fishery, Dorchester, Dorset. Sat, 21. Paddy Bendell 14-12-0, carp and roach on poled meat and corn; Maggie Bell 14-10-0; Will Aldridge 13-0-0; Lewis Foster 10-4-0. Intermediates: Gabriel Bell 10-0-0; Cassie Young 7-14-0; Ryan Keirnan 6-10-0. Sun, 27, Broadlands Lakes, Romsey, Hants. Joe Sheppherd (Gillingham AA) 43-8-0, carp, poled worms in margins; Rob Randall (Garbolino BVMG) 37-0-0; Ricky Searle (Gillingham AA) 34-11-0; Dave Sealy (Gillingham AA) 31-4-0; Alfie Dyke (Gillingham AA) 27-12-0; Michael Hunt (Gillingham AA) 24-4-0. Gwinear, Newquay, Cornwall. Tues, 8. Roy Booth (Bake) 180-10-0, carp, poled corn, peg 22. Sun, 15. Mark Baston (Swindon) 122-10-0, carp, poled corn, peg 25; Mark Capewell 98-7-0; Simon Gould (Daiwa) 83-0-0. Kingston Rodbenders, River Thames, Canbury Gardens, Kingston, Surrey. Thurs, 32. Dave Hurry (Daiwa Dorking) 19-7-0, bream, feedered maggots, end peg 1; Brian Wallin ( Free Spirit) 14-14-0; Tony Lock (Apollo) 10-2-0; Andy Love (Love Machine) 7-12-0; Andy Rogers (Guildford AC) 7-3-0. KC Angling, River Thames, Molesey, Middx. Mon, 10. Steve Sanders (Preston Innovations) 10-8-0, roach and dace, poled maggots, end peg 1; Tim Kaye (KC Angling) 7-15-0; Ray Tingley (Surbiton AC) 3-0-0. Marazion AC, Garras Lake, Helston, Cornwall. Sun, 9. Roger Baker (Sensas Thyers) 23-12-0, skimmers, poled corn over groundbait, peg 20; Brian White (Marazion AC) 20-8-0. Marsh Farm, Godalming, Surrey. Wed, 22. Steve Sanders (Preston Innovations) 63-12-0, tench and skimmers, poled casters and worms, peg 13; Russ Berryman (Apollo) 48-3-0; Paul Hiller (Daiwa Dorking) 34-4-0. MBK Leisures Juniors, Coloured Ponds, Rake, Sussex. Fri, 15. Under 9s: Keiran Goddard (Aldershot) 12-4-0, carp and silvers, pellet; Calvin Spiers (Guildford) 12-0-0. 9-12s: Nathan Blackwell (Farnborough) 34-4-0, carp and silvers, pellet; Jessica Carter (Alton) 17-6-0. 13-17s: Karter Whittock (Froyle) 18-0-0, carp and silvers, pellet; James Bonnett (Horndean) 12-4-0. Mid Cornwall Fishery. Summercourt, Cornwall. Thurs, 8. Joans lake. Roy Booth (Bake) 74-4-0, carp on poled corn, peg 7. Molesey League, Willingshurst, Surrey. Sun, 24. Geoff Simmons (Willingshurst) 148-0-0, carp, poled pellets,peg 26 undisclosed lake; Derek Galliford (Willingshurst) 135-8-0; Joey Clarke (Drennan Bordon) 107-12-0; Malcolm Fowler (Feltham) 101-8-0. League: Terry Harrison 32. Monk Lakes, Staplehurst, Kent. Wed, 19, Lake 3. Jim McDowell (Monk) 202-6-0, carp and F1s, poled pellet long and short, peg 125; Paul Hoffman (Matt’s Tackle) 180-0-0; John Larraman (Preston Innovations Delcac) 159-0-0; Martin Orwell (Monk Lakes) 146-10-0. Sat, 22, Lake 3. Mike McMillan (Preston Innovations Delcac) 229-8-0, carp and F1s, poled pellet long and short, peg 125; Len Goodwin (Medway Tackle) 177-8-0; Dean Locke (Preston Innovations Delcac) 175-6-0; Derek Gladwin (Preston Innovations Delcac) 158-0-0. Sun, 15, Lake 2. 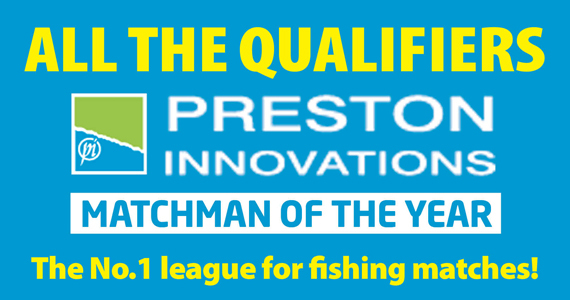 Mike McMillan (Preston Innovations Delcac) 189-12-0, carp, poled pellet, peg 86; Pete Upperton (Middy) 168-10-0; Derek Gladwin (Preston Innovations Delcac) 139-12-0; John Coster (Bowlers) 127-2-0. Ockendon Bait and Tackle, Puddledock Farm, Ockendon, Essex. Wed, 30. Marius Grigaitis (Route 77 Energy) 189-8-0, method feeder tight to far bank, Snake peg 54; Gavin Bridge (DH Floats) 135-10-0; Jason Collins (Preston Innovations Delcac) 133-6-0; Cliff Adams (Browning Wickford) 112-0-0. Shiplate Farm, Weston Super Mare, Somerset. Sun, 15, Westpool. Andy France (Maver Cadbury) 67-15-0, carp, long poled meat and pellet shallow, peg 11; Russ Peck (Thatchers Tackle) 59-0-0; Dom Sullivan (Maver Cadbury) 56-12-0; Steve Howell (Shiplate Farm) 53-14-0. Silvers: Carl Hobden (Shiplate Farm) 20-8-0. Stafford Moor, Winkleigh, Devon. Wed, 22, Tanners Lake. Chris Haines (Haines Angling) 148-4-0, 30 carp, wagglered pellet shallow, peg 6; Jamie Burt (Tameside) 140-15-0; Andy Winters (Haines Angling) 128-1-0; Dave Wykes (Torquay Round Table) 119-2-0; Ricky Jonson (Torquay) 118-7-0. Fri, 20 Woodpecker. Jamie Burt (Tameside) 208-8-0, 33 carp, wagglered pellet shallow, peg 6; Alfie Burt (Tameside) 149-10-0; Roger Abbotts (Stafford Moor) 120-5-0; Stu Willmott (Bucks) 114-6-0; Tony Blight (Barnstaple) 103-2-0. Tillingbourne, Gomshall, Surrey. Tues, 16, over-55s. Nick Stunt (Apollo) 44-12-0, carp, poled meat, peg 1; Dean Liffen (Ealing) 36-4-0; Bozzy Beard (Kingston Rodbenders) 24-7-0. White Acres, Newquay, Cornwall. Mon, 63. Trelawney, Twin Oaks and Acorn. Phil Morris (All the Gear No Idea) 87-12-0, carp on pellet feeder and pole shallow, peg 25 Trelawney; Nigel Marchington (Golden Maggot) 84-11-0; Bob Dac (Edgeley Sports) 83-5-0; Paul Moore (Edgeley Sports) 80-3-0; Danny Hamilton (Grange) 72-8-0; Andy Mex (Bird’s Tackle) 70-8-0. Wed, 53. Twin Oaks, Trelawney and Acorn. Wayne Bradley (Allan’s Tackle Leamore) 71-4-0, carp on pellet feeder and paste in the margins, peg 10 Acorn; Keiran Bailey (Somerset) 68-1-0; Dave Anders (Leyland) 64-9-0; Paul Jagger (Leigh Tackle and Bait) 63-2-0; Chris Mayers (Bob Co) 58-2-0; Mark Brown (Elmbridge) 56-1-0. Thurs, 118, Preston Innovations Rover, all lakes. Nigel Marchington (Golden Maggot) 118-0-0, carp on poled pellet shallow, peg 2 Jenny’s; Warren Cave (Acorn Angling) 110-10-0; Carl Boyd (White Acres) 102-8-0; Terry Naules (Anglers Corner) 96-2-0; Olly Corbett (Wythall Legion) 95-4-0; Paul Haines (Aintree) 91-4-0. Ladies: Claire Hollis 69-2-0. Willinghurst Lakes, Surrey. Sun, 16, Old Lake. Luke Sheriff (Guildford Angling Centre) 187-0-0, 32 carp on shallow pole plus meat and sloppy groundbait down edge; Paul Taylor (Guildford Angling Centre) 126-8-0; Dave Carter (Guildford Angling Centre) 92-8-0. Willow Park, Ash, Hants. Wed, 15, over-50s, Middle Lake. Eddy Rippon (Willow Park) 34-12-0, carp, wagglered pellets, peg 17; Barry Upperton (Meatbashers) 33-12-0; Colin Carr (Willow Park) 19-0-0. Fri, 17, Small Lake. Brian Stevens (Willow Park) 46-0-0, carp, poled meat, peg 28; John Ward (Willow Park) 45-8-0; Gary Clifford (Willow Park) 39-0-0. Sat, 18, Middle. Ken Russell (Browning Crowsports) 49-4-0, carp, poled pellets, peg 15; Mathew Jefferies (Leatherhead) 37-0-0; Mark Holland (Willow Park) 20-10-0. Wylands, Battle, East Sussex. Mon, 9, Old Snake Lake. Jonathan Watt (Shimano/Dynamite Baits) 107-8-0, carp, paste in the margins, peg 8; Paul Lawton (Marukyu) 78-6-0. Sun, 12, Snake. Danny Wynne (Garbolino Apollo) 142-0-0, carp, poled pellet, peg 4; Bob Helder (Wylands) 81-4-0; Steve Grounds (Wylands) 81-0-0.